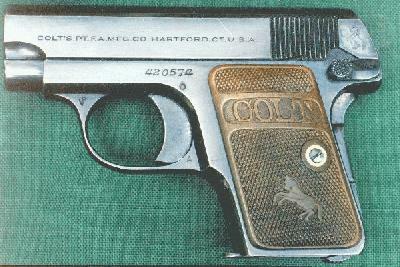 Colt 1908 Vest Pocket serial number 408652 - Pre-Post/War example with two line slide marking on left side of the slide. Gun has a tank blued post-war finish and a visible hardening line on the front of the slide. 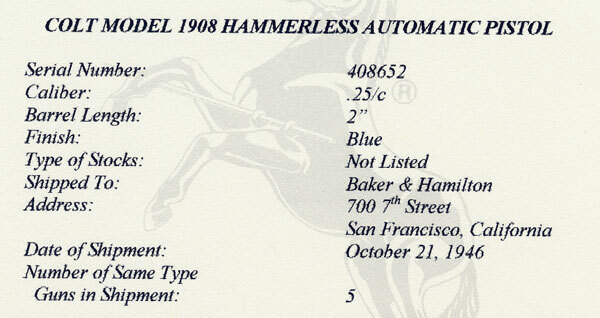 Pistol was one of five shipped to Baker & Hamilton, 700 7th Street, San Francisco, California on October 21, 1946. These guns were assembled from available parts. 408652 has a steel grip screw escutcheon on the right grip. These escutcheons were used on the checkered walnut grips on WWII vintage Model M pistols. 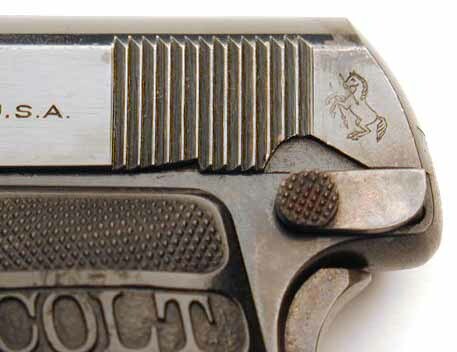 Until recently, most collectors have associated the single line slide marking on the Model N with the 705 post-war pistols produced in the 420000 serial number range. 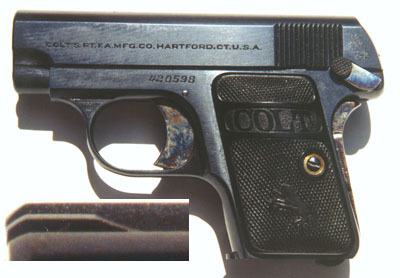 A few of these pistols above the terminal pre-War serial number 409061 have been encountered with a 409000 range serial number and the single line slide marking. Serial Number 409349 (above), is fitted with checkered walnut grips and 409177 (below) is fitted with surplus Type II Hard Rubber grips. 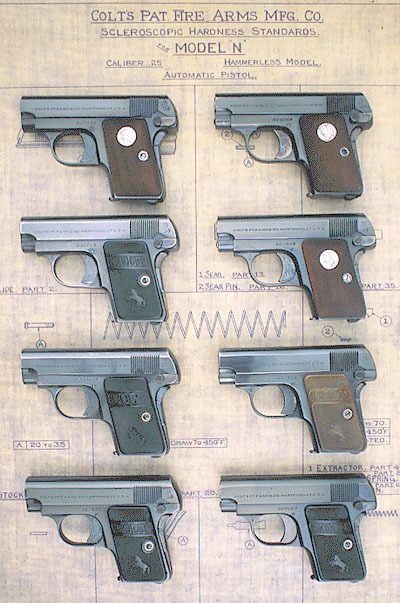 Both of these pistols have their original post-war boxes, with post-war instruction sheets. 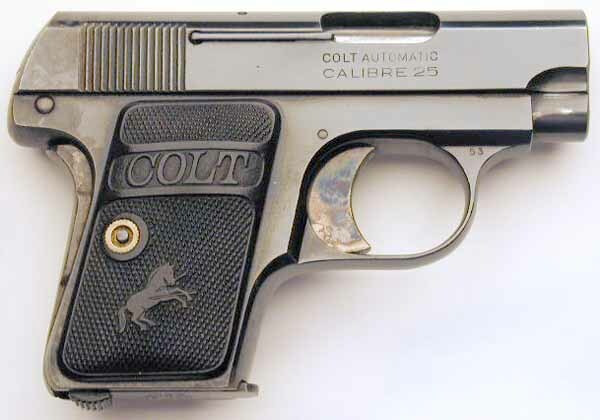 Colt Model N serial number 420132. Most serial number references indicate that the highest production serial number for the Model N is 409061. 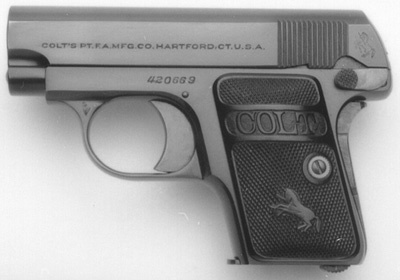 After WWII, Colt's produced 705 guns in the 420000 serial number range from 420001 - 420705. 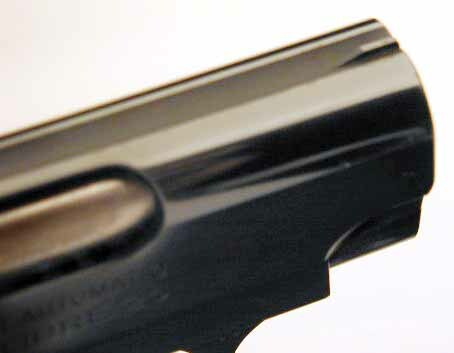 These guns are readily identifiable by the single line slide marking on the left side of the slide and are often encountered with black hard rubber grips. They are classified as "pre/post war" variations since they were constructed from left-over pre-war parts, but were shipped after 1945. Model N sn 420172 features machine checkered walnut grips with flush medallions. 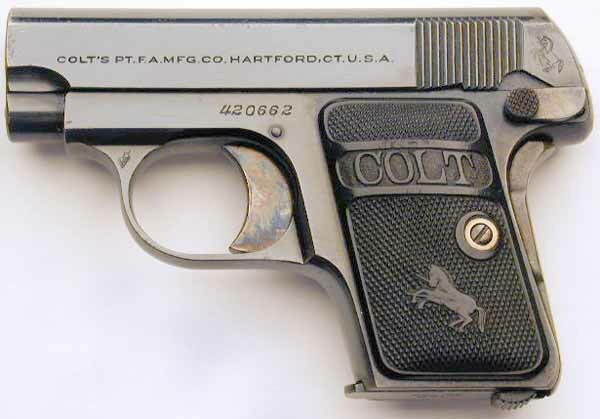 A unique feature of this pistol is the omission of the Rampant Colt logo on the left rear of the slide behind the serrations. 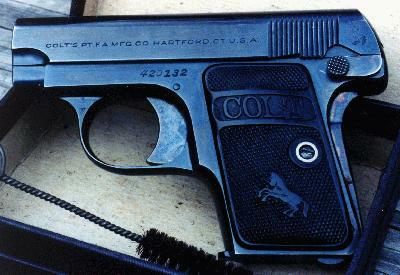 Colt Model N serial number 420574. 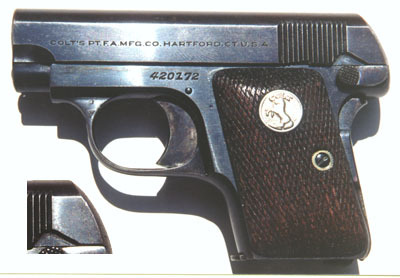 Of the 705 guns produced in the 420000 serial number range, this is one of four guns recorded in the factory production book as having been scrapped. It has some unusual features which may indicate that assembly of this gun occurred sometime after this model was out of production. (see photos below). The brown grip is indicative of long exposure to light. The grip on the right side is black. 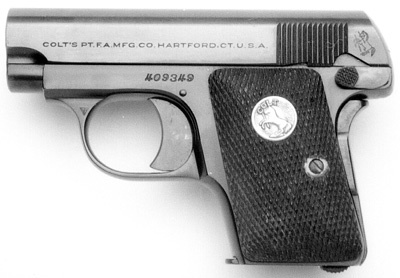 Additionally, the front sight on this example and the last 200 or so pistols was ramped. 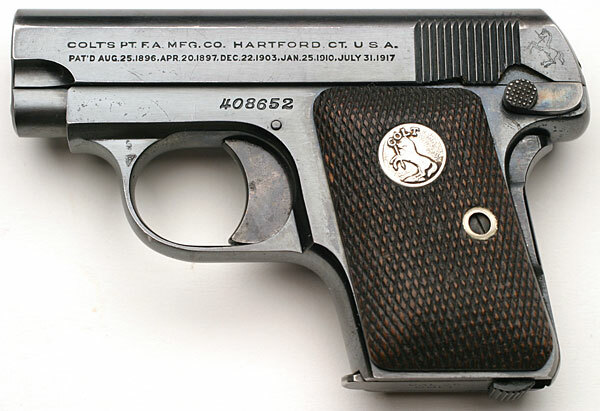 This five-pointed hollow star appears on the lower right trigger guard of serial number 420574. 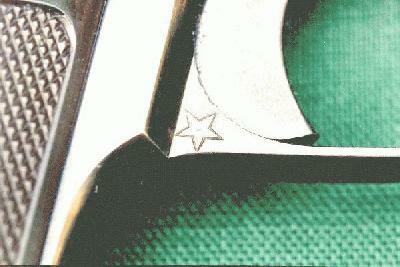 The mark in the center of the star appears to be an initial misstrike of the marking die. The significance of this mark is unknown. 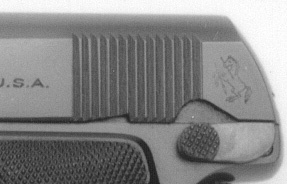 Additionally, the assembler's number "88" appears on the upper right flat of the trigger guard. 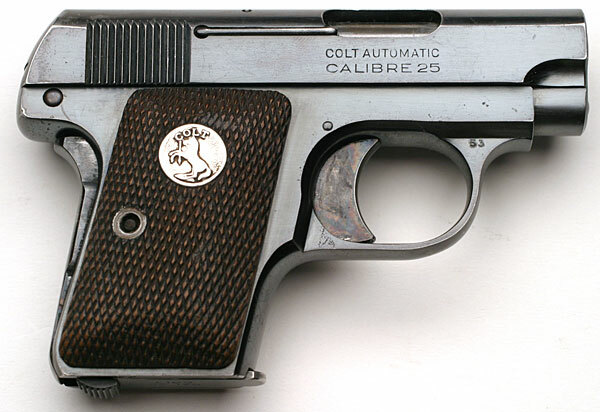 Every other known example of the pre/post-war Model N has the number "53" on the upper right flat of the trigger guard. 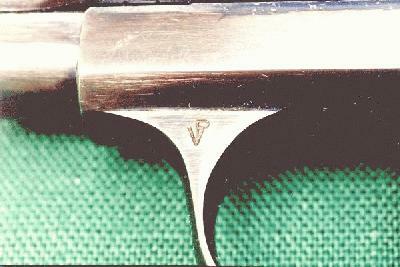 Also, the upper left flat of the trigger guard of 420574 contains a very unusual variation of the verified proof or "VP" mark. Model N 420598 has Type II hard rubber grips and an unusual ramped front sight which appears on this model after sn 420450. 420662 reverse cut slide serrations. 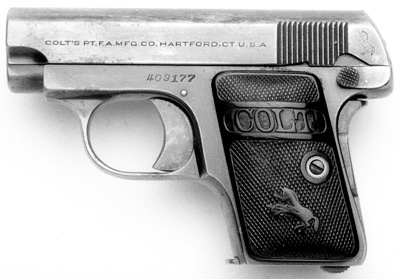 This pistol, sn 420669, is just 36 numbers away from the last pistols produced. It was shipped on December 30, 1946 in a two gun shipment to Clapp & Treat, Hartford, Connecticut. It is in near mint condition with it's original box (numbered to the gun with the additional notation "Rubber" to indicate the type of grips) and post-war instruction sheet. Distinguishing characteristics of this pistol include a tank blued finish, Type II black hard rubber grips, and an unusual ramped front sight that has been observed on these pistols from 420519 to the end of production. Perhaps the most distinguishing characteristic is that the slide serrations were cut in reverse!